D.S. 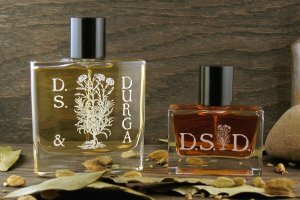 & Durga, the Brooklyn-based, independent-perfumer duo, has revamped its fragrance line for 2011. Some of the original scents have been tweaked a bit, and nine new scents were added; the entire line continues to "take inspiration from antiquated herbal wisdom, native ritual medicine, Americana, outdated lore, geography, history, and gastronomy." I've just tried the three new "feminines," each of which has its own distinct mood. Poppy Rouge takes its name from a lyric in Mississippi John Hurt's "Richland Woman Blues," and it's a blend of orange flower, jonquil, and Parma violet. It's not as impulsive and racy as its source might suggest, but it would make a lovely spring fragrance. It's a fresh bouquet of orange blossom, the nicest one I've smelled since Atelier Cologne's Grand Neroli. As it evolves, an almost lily-like note (the jonquil?) emerges, but the violet is very, very subtle. Like many of scents from D.S. & Durga, Poppy Rouge smells as though it contains a high percentage of natural ingredients. The Orchid Drinkers refers to the nineteenth-century taste for a drink called salep, brewed from ground orchid tubers. Its composition includes orchid, sandalwood, bergamot, and white tea. The Orchid Drinkers begins politely, with an opening accord of bergamot and something that reminds me of chamomile. The heart of the fragrance is a soapy iris with an earthier note of orris root gradually emerging from underneath it. There's another tea note in the drydown: this time, the pale, dry note of white tea. The Orchid Drinkers could easily be worn by men as well as women. Five Step Waltz evokes the sensuality of a waltz and the shocking effect this dance must have had when it was introduced into genteel Victorian ballrooms: it's an intense harmony of vanilla, amber, lavender, jasmine grandiflorum, and Moroccan rose. Five Step Waltz starts with a burst of smoky-creamy jasmine. Just when it seems a bit too rich for everyday wear, the scent mellows into a jasmine-amber core, and then into a soft vanilla enhanced by a rubbery-sweet ylang-ylang note. An old, dear friend of mine who sells vintage goods on Etsy recently told me that she has noticed an increasing market for garments, home furnishings, or any other rustic-chic item tagged as "heritage," "artisan," or "Americana." D. S. & Durga was at the forefront of this trend, and they're still executing it well. Their imagined world is a pleasure to enter, because it's finely detailed and modestly scaled — their fragrances have individual identities, neatly crafted compositions, and reasonable prices for an "indie" line. Now, please excuse me while I go sip a cup of tea and doll myself up in preparation for a night on the dance floor. D.S. & Durga Poppy Rouge, The Orchid Drinkers, and Five Step Waltz are each available as 30 ml Eau de Parfum ($85). For buying information, see the listing for D.S. & Durga under Perfume Houses. I think this is a great line and plan to order a FB of Poppy Rouge. DH likes, but doesn’t love most of the men’s scents from the line. Lately I’ve been loving DS&Durga, Soivohle and (especially) MCMC. All three lines are so fantastic. Thanks for the review! I might wanna smell Orchid Drinkers, but “polite” makes me nervous! I do like earthy and tea scents, however, and I AM trying to find some lighter scents (thanks for all the help yesterday!). Marjorie, it does have some earthiness… but for even more, you might want to check out their Orris Root! Nerd, I like more natural-smelling scents for spring… so these are good candidates. Also, I believe they sell samples. These do sound lovely, expecially Five Step Waltz. I’ll have to see what I can do about getting a sniff of these. Am I wrong in thinking Anthropologie is carrying this line? Maggie, their website lists the stores that carry the line; I believe Anthropologie only carries the few scents created specifically for Anthropologie, however. Orris root at tea? The Orchid Drinkers just went on my sample list for sure. Halimeade, I agree, that tea sounds wonderful! Thanks for these enticing reviews, Jessica! I love DS&D My Indian Childhood – no curry in sight but rather the mouthwatering floral kewdra with almost a dusting of patchouli. Looking forward to sampling more from this line. Thanks for the article, Jessica! I like the sound of Poppy Rouge. While I’m not familiar with these scents, I love me some D.S. & Durga. I heard of them a few years back and recently met the owners at the Elements showcase. I couldn’t be more proud that they’re from Brooklyn. Five Step Waltz sounds like something I need in my life. FM, It’s good to hear from a Brookynite!! DS&D do a nice job all around, don’t they? I bet a man *could* try the Five Step Waltz, even though it’s a little more traditionally feminine than most DS&D scents… it has just enough amber and a slightly smoky aspect. Poppy Rouge is on my list to buy this year; even though I don’t care for orange blossom, I couldn’t resist the Hurt reference. Five Step Waltz is more my style…but how strong is the vanilla note? And the lavender kind of scares me in with the rest. Jolie, I have to confess that I didn’t know who Mr. Hurt was until I started researching these fragrances, but now that I’ve listened to a few clips via YouTube, I want to hear more! I don’t notice the lavender in Waltz; the vanilla is noticeable, but not too dessert-like. I’d say you need to like jasmine to wear this fragrance, but you don’t need to *love* vanilla. Thanks for these wonderful reviews! Have you had the chance to sniff D.S. & Durga’s creation for the NYC boutique In God We Trust (a chic boutique dedicated to a local “heritage” and “Americana” aesthetic)? It’s a wonderful creation, a feminine scent that could also be worn by a man, described by them as “roots scrubbed clean.” It smells of fresh, earthy springtime to me. Hi Pamphilia, I’ve never actually gone inside an In God We Trust shop — much too hip for me! but I’m sure DS&D did a nice job with their custom scent.